Published: May 7, 2014 at 06:38 p.m. Updated: May 7, 2014 at 07:06 p.m. The 2014 NFL Draft is -- really, I promise -- almost here. On Thursday, the world will finally learn, after months of hype and anticipation, exactly what the Houston Texans have decided to do with the No. 1 overall pick. Of course, that still remains a mystery for now, but I do know one thing: The team absolutely must nail this selection. Houston has to do some serious building if it wants to keep up with Andrew Luck and the Indianapolis Colts. After capturing back-to-back AFC South titles, the Texans faltered badly in 2013, sputtering to a 2-14 record -- and, thus, possession of this pick. While they might like to trade down -- perhaps to solve their pressing quarterback issue -- I think they'll have a hard time finding a partner, meaning they'll likely have to make a choice at No. 1. After seven years with Matt Schaub atop the depth chart, Houston needs to find a new quarterback. Schaub is in Oakland, having been traded to the Raiders following a dismal 2013 campaign, and the rest of the signal-callers on the roster (Ryan Fitzpatrick, Case Keenum, T.J. Yates) are really backup types. I don't see a quarterback prospect who would merit being drafted first overall, but the Texans could trade down for either Johnny Manziel (Texas A&M) or Blake Bortles (UCF). Bortles is probably a better match for coach Bill O'Brien, but Manziel is a better prospect. Alternately, Houston might want to wait until the top of the second round. Pittsburgh's Tom Savage and LSU's Zach Mettenberger are two traditional drop-back quarterbacks who would fit well in O'Brien's system. Former first-round pick Whitney Mercilus is a promising young player, but the Texans still lack a premier pass-rushing outside linebacker to complement all-world defensive end J.J. Watt. South Carolina's Jadeveon Clowney is the top player in the draft and should be taken at No. 1 by Houston. The team should not be distracted by buzzy Buffalo product Khalil Mack; yes, Mack is better in coverage, but that isn't a good reason to pass on Clowney, who is simply too special as a pass-rusher. Should the Texans choose to trade down and take a quarterback in Round 1 instead, Marcus Smith (Louisville) would be a great fit on their defense. If Houston wants to boost the talent level and depth on the defensive line, Princeton's Caraun Reid and Alabama's Ed Stinson would be good mid-round options. Reid would offer a bit more upfield pass-rush ability, while Stinson is stouter against the run. 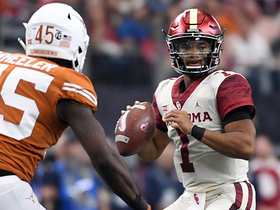 The Texans must address this position in the draft, and Alabama's Cyrus Kouandjio -- provided he checks out medically -- would be a great pick at No. 33. Kouandjio has the strength to dominate in the run game, and he's athletic enough to hold up in pass protection.